Several years ago, I spotted what seemed to be a great deal on Ebay. Some guy was selling a gigantic pile of unpainted Wargames Foundry Sea Peoples figures (28mm, of course) for a very, very low price. I don’t remember exactly how low, but it was low enough to prompt me to buy the entire lot, despite the fact that all of my ancient armies up to that point had only ever been 15mm and I didn’t know anyone else playing ancients in that scale. On top of that, I knew very little about the Sea Peoples. Didn’t matter, of course. They were gorgeous figures. “And do you have any chariots for them?”, I asked. I knew that the DBA/DBM lists included chariots for the Sea Peoples. He did not have any, but for a small additional fee, he would throw in several Hittite and Trojan War chariots. Close enough, I thought. The Sea Peoples (as I was just then reading) came probably from the Aegean region and the coast of Asia Minor. Besides, I figured, you’ve seen one Chariot, you’ve seen ’em all. It was impulse buying at it’s best. As soon as the army arrived, I had no idea what to do with it. The army went on to sit on my shelf, unpainted, for the next several years. It probably would have continued that way, but last December, I was in a real resolution-making mood, and one of my resolutions was to finally paint that pile of lead. I was already playing FoG, but not that particular period and not that scale. I went out and bought a copy of the FoG army list book, Swifter Than Eagles, and started building an army. It is now March, and I’m still building, but I have managed to get some of the units close to completion and based. Here are a few shots of some of the first based units. I still have to add the groundwork, so it looks like they are standing in snow at the moment. Eventually, I’ll get all the bases painted and properly flocked. 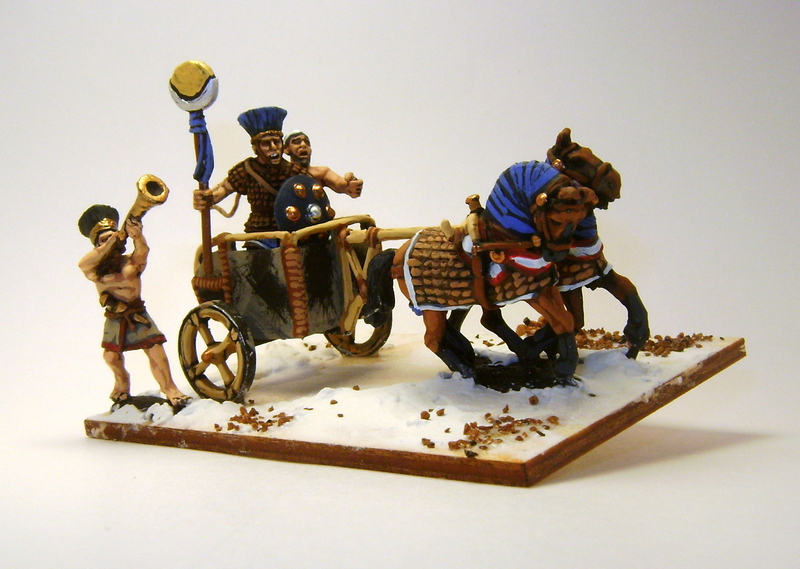 I quickly learned that space is limited in the chariots, so that the size and bulkiness of the figures used for the crew were important factors. 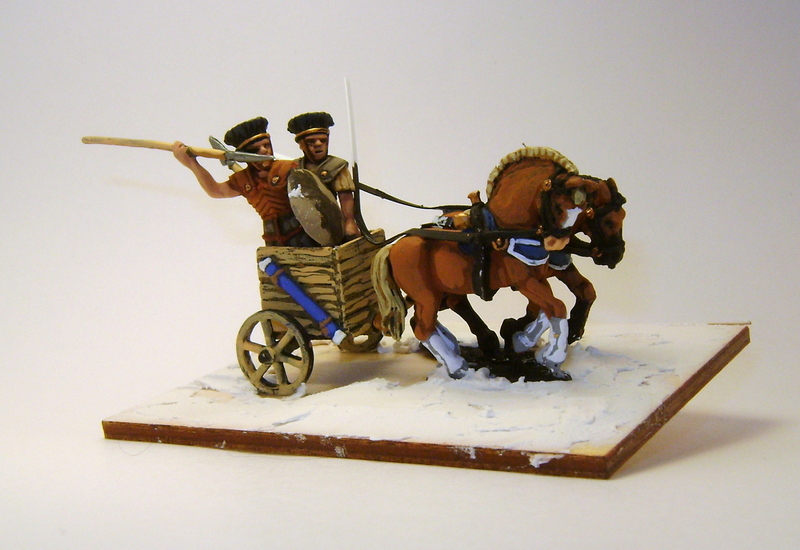 This was especially true because I had no figures designed specifically as charioteers. 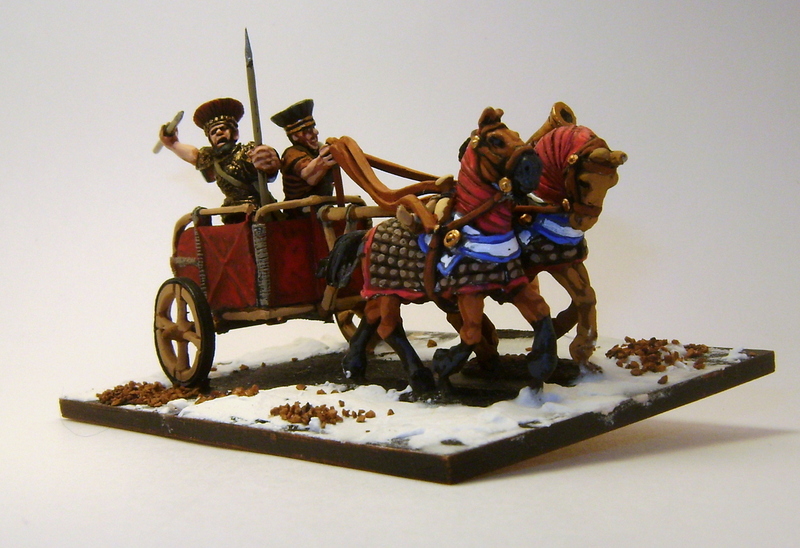 The driver of the “red” general’s chariot is a Ral Partha Sea People, which I chose for his small size. The driver of the “blue” general was posed so that he had a small profile and could fit beside the other man. His whip was made simply by twisting two very thin wires together and gluing both ends. Next up is rank & file chariot. The crews of all the line chariots are Castaway Arts, which I chose because their pose and thin builds allowed me to fit them into the tiny cab. I gave the Trojan War chariots with their fancy armored horses to the generals while the rankers got the plain Hittite wooden box chariots and unarmored horses. Notice that the reigns are unfinished also. That’s because I have developed a system for assembling and painting chariots. First, I assemble the chariot itself. 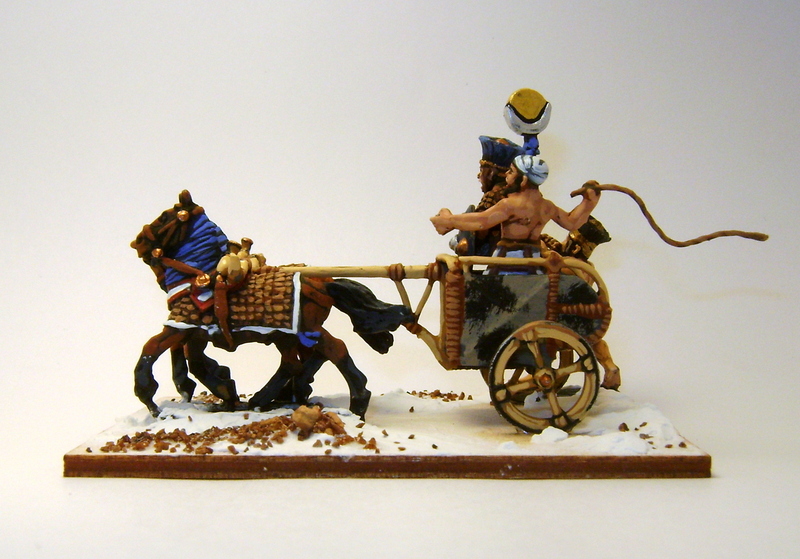 Second, I paint the crew, horses, and chariot as separate pieces. Then, I assemble them together on the base. The fourth step is to add the reigns and paint them. So, the next time you see these guys, they will have the reigns also. Finally, here are some of the infantry. The first shot is of some of the light infantry, armed with javelins. The second shot shows a stand of the medium infantry, which is the mainstay of the Sea Peoples army. Each of these figures are by Foundry. I hope you enjoy these. I am certainly enjoying painting them. I’ll post some more shots soon, including some fully painted, complete units. 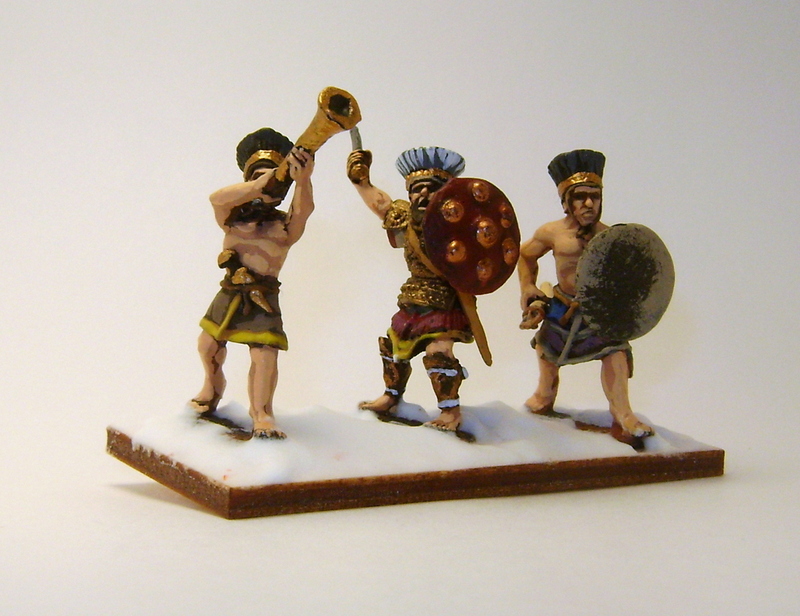 I’ve always been a big fan of Biblical armies in 28mm. These are simply fantastic. Great painting style, can’t wait to see them completed!